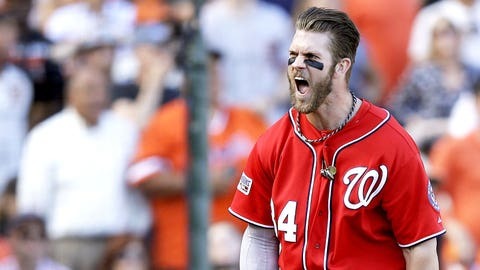 Why would the Nationals pick a fight with Bryce Harper, their most promising and marketable player? Excellent question. But unless the two sides settle a dispute that dates to Aug. 16, 2010, the day Harper signed his original draft contract, they will spar in a grievance hearing in December, according to major-league sources. At issue: Whether Harper is allowed to opt out of his deal and enter baseball’s arbitration system, enabling him to start negotiating higher salaries. Either way, Harper is under the Nationals’ control for four more seasons. But millions hang in the balance, which is why both sides are bracing for a legal battle. A battle that the Nationals, in particular, should do everything possible to avoid. Even if they hold the winning argument, they stand little to gain by antagonizing a potential franchise player. Nationals general manager Mike Rizzo declined to comment when asked about the possibility of a hearing, which was first reported by The Washington Post last November. So did Harper’s agent, Scott Boras. Harper, 22, is entering the final year of his original five-year, $9.9 million major-league contract. His salary will be $1 million, and he stands to earn an additional $500,000 in roster bonuses. As a "Super Two" arbitration player — Harper has built enough service time to qualify for an extra year under the process — he would stand to earn considerably more. Royals first baseman Eric Hosmer, the top hitter in last year’s "Super Two" class, negotiated a $3.6 million salary. Harper, a two-time All-Star and the 2012 National League Rookie of the Year, is far more accomplished. He also is the centerpiece of national marketing campaigns, increasing his value to the franchise. For the sake of discussion, let’s say Harper entered the arbitration system immediately and his first-time number was $5 million. He then would have three more years to build upon that foundation, his salaries escalating as long as he remained healthy and productive. But, as The Post reported, Harper and the Nationals disagree on whether the team included the opt-out clause in the original deal. The dispute emanates from the chaotic final moments of Harper’s negotiations with the team as the first pick of the 2010 draft. The two sides did not reach agreement until less than a minute before a midnight deadline, and the Nats and Boras did not finalize all of the terms in written form. The Nationals’ position is that they never agreed to the opt-out provision, which at the time was considered almost standard for such deals (major-league contracts for draft picks no longer are permitted under baseball’s collective-bargaining agreement). In fact, the provision was so common that the Nationals awarded it to third baseman Anthony Rendon, their first-round pick the following year. Rendon, like Harper, is a Boras client. When the Nats failed to include the opt-out in Harper’s final written contact, Boras and the Harper family declined to sign the deal, according to The Post. Major League Baseball and the players association then drafted a letter stating that if Harper qualified for arbitration before the end of the deal, a grievance hearing would determine whether he could opt out. The hearing has not yet been scheduled, but would take place in December, in advance of the annual exchange of arbitration figures in January, sources said. Perhaps a deadline, in the form of a hearing date, will force the sides to settle. The Nationals, though, may feel they have nothing to lose. Harper likely is headed for free agency regardless after the 2018 season; Boras generally prefers his clients to establish their values on the open market. A new, long-term deal would be one way for the two sides to avoid a hearing. The Nats also could relent and allow Harper to become arbitration-eligible. Both of those potential solutions, however, seem unlikely at this late stage. So, is the club truly willing to tangle with Harper and Boras in a contentious grievance hearing, and then again — depending upon the outcome — in three or four potential arbitration cases? What kind of message would the Nats send other players if they refused to award Harper the same right they gave Rendon? Again: Why pick a fight?